A nice new CertainTeed Northgate Roof in the Granite Gray color along with new white gutters. Did your roof suffer any damage during the 2018/2019 winter? How about during the “polar vortex” where temperatures dropped as low as -29 degrees in some parts of Wisconsin? Did you discover a roofing leak as the weather warmed or an ice dam problem that you’d like to have repaired or possibly prevent from happening the future? While winter isn’t totally over yet, it’s a good idea to start lining up your roofing contractor to inspect, repair, or replace your roof if you think your home needs the attention. Extreme cold or freeze thaw cycles can cause damage to a roof, especially under certain conditions and the last few months of weather have created the perfect environment for roof damage to occur. When the weather is cold and climbing around on a roof is dangerous we’ve now started to use drones for roofing inspections. 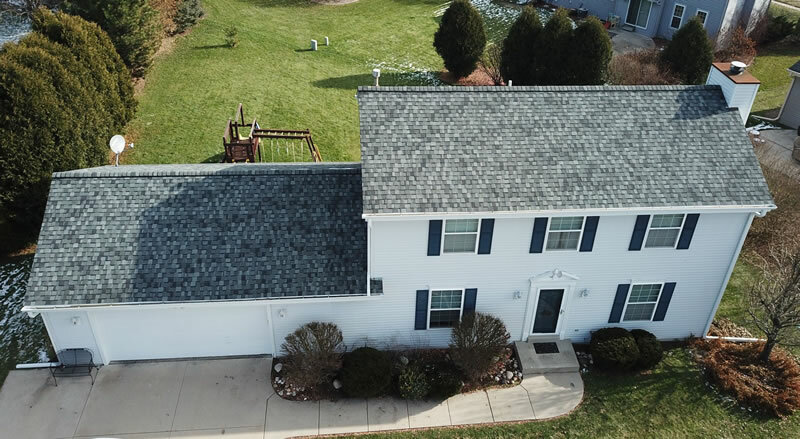 With a drone we’re able to get up close and personal with your roof to discover any glaring issues using a high-definition camera. This is especially useful for roofs that are covered with snow and ice or are very steep. While we can’t spot every potential issue with a drone, they can help us spot the obvious issues and if we can catch them early we can possibly prevent further damage. This winter we’ve had some exceptionally cold days and extreme temperature fluctuations. This type of weather can create the perfect environment for ice dams. What is an ice dam and why should you care about them? An ice dam can occur when the temperature difference between the inside and outside of your house forces the snow or ice on your roof to melt. As the ice and snow melt it runs down your roof towards the gutters and then it can refreeze into an ice dam. This dam of ice works against your roofing system by preventing the melting water from running off your roof. Instead it forces the water back up and under your shingles, into cracks, flashings, soffit joints, and many areas you really don’t want water to go. If the ice dams are ignored they can also cause damage to gutters and fascia boards by literally prying them from your home from the pressure of the ice build-up. Depending on how severe your ice damming problem is we might be able to offer solutions for repair. What Are The Signs Your Home Is Suffering From Ice Dams? There are several signs to be aware of aside from the obvious roof leaks that could be associated with ice damming. Large icicles hanging off your roof eaves suggest the right melt/freeze conditions exist within your roofing system. Do you have any water staining on ceilings or in the corners where walls and ceilings meet? Do you have any lights or electrical fixtures that all of sudden have stopped working? If your roof is beyond repair and needs to be replaced we can make sure it’s installed correctly which can help to prevent ice dams from occurring in the future. Is It Finally Time To Replace That Leaking Roof? Have you discovered that your roof is leaking? It’s not such an obvious problem when we have freezing weather but as the snow and begin to thaw any damage that occurred to your roofing system over the winter can slowly rear it’s ugly head. If you’ve discovered a leak or multiple leaks in your roof then give us a call right away. In some cases (safety dependent) we can offer a temporary fix for the problem and then book your roof for replacement as soon as the weather cooperates. If you’ve made the decision to go with Paragon Exteriors for your roof replacement it’s important to book you’re project early for a number of reasons. Roofing materials have been raising in price over the last few years. By booking your project early you can lock in current pricing (no money down). With spring rapidly approaching we’re going to be fully booked soon. If you want a new roof this spring it’s a good idea to get the wheels in motion now. Any damage that may have occurred to your roof this last winter needs to be addressed quickly to prevent further damage as the weather gets warmer. While we’re working on your roof we’re also going to be looking to repair any minor issues that can help prevent a failure from occurring in the future. This includes inspecting your roof decking and replacing any plywood that is soft, wet, or rotten due to ice dams. We’ll also be making sure you have adequate ventilation in place (which can prevent ice dams from occurring in the first place). We will install proper roof underlay, a proper drip-edge, and we’ll also make sure your roofing flashing is correctly installed. Have A Large Roof That Needs Replaced? More Reason To Book Early! If you are looking to replace the roof on a multi-family structure such as a condo or townhome or several homes within a home owners association it’s even more important to book your project early. These large projects often require more roofing shingles than what local suppliers will have on-hand so they need to be ordered in advance. With price increases on the way booking your roofing project now could potentially save you hundreds, if not thousands of dollars because the suppliers will honor their current pricing. Should You Pay Your Roofing Contractor In Advance? At Paragon Exteriors LLC we don’t ask for money down or deposits on most residential roof replacement projects with exception of very large multi-family buildings where the material costs can be into 6 figures. We have excellent relationships with our shingle suppliers and we only charge our customer when the roofing services have been completed to your satisfaction. Be very wary of any roofing contractors asking for deposits or up-front payments to “reserve your spot” in their spring calendar. Quite often a homeowner will pay a deposit on their new roof only to never hear from the contractor ever again. If you need your roof inspected to see if you need some simple repairs or if a total replacement would be a better decision Paragon Exteriors LLC can help. We provide our roofing services throughout Waukesha County and Milwaukee County Wisconsin. With our meet or beat pricing structure and our lifetime workmanship warranty on our installations we are one of the top roofing contractors in Wisconsin. If you’d like to schedule an inspection or estimate for roof repair or replacement please call (262) 565-8282 or fill out our online form and we’ll get right back to you.